Industrial wheel casters are complete wheel and horn assemblies that attach to material handling equipment to allow movement. There are two basic types of industrial casters: rigid and swivel. Rigid casters permit only straight-line movement. 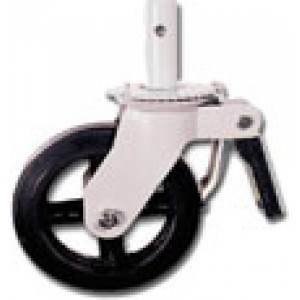 Swivel casters allow movement in any direction. Some varieties of swivel casters also include a lock that, when engaged, transforms the swivel into a rigid-style caster. Both rigid and swivel industrial casters are made out of materials such as aluminum, brass, chrome, copper, iron, steel, plastic, and rubber.